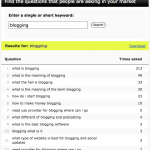 Keyword research tool Wordtracker recently added a cool free tool called Keyword Questions. I think this has some great SEO potential for small business marketers. Search engines have gotten really good at returning results for anything people want to know, so a growing number of people search by simply asking questions. What is marketing? How to install WordPress widgets? How to make a duct tape wallet? The idea Keyword Questions is that you can put any keyword of phrase in its search box and it will return a list of the actual questions people are asking about that topic and some measure of the volume. Using this tool for all of the various terms related to your business could spark some great and very specific ideas for creating blogs posts and pages that address and are optimized for these exact questions. I am often asked why business owners would want a blog and this is a great reason. People may not be looking for another blog to read, but they are searching for answers to questions and challenges and getting good at answering those exact questions is a fabulous way to use a blog to build business.